How can I invite another instructor to a Section in my Course? 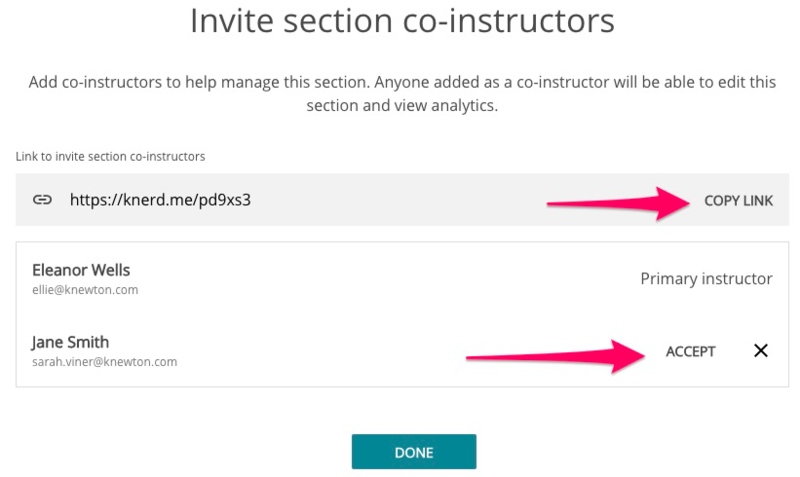 You can invite others to be section co-instructors in your course. Section collaborators will be able to view and edit portions of your course. This person will also have access to student data. While they may add items to their assigned section, they may not delete items. 1. Navigate to your course and select the correct section from the list. 2. Select the Add Instructors button on the top right corner. 3. Click Copy Link and share with anyone you would like have the ability to view and make changes to your course or sections. They will be directed to register with alta after clicking the link. 4. Once they click this link, you must then click Accept on this same page. 5. After you accept this person into your section, you will be all set!